This is the history of three travelers spanning the birth of YASME--the boat that carried young sailor Danny Weil on his first voyages beginning in 1954--and the lives of famed ham radio DXpeditioners Lloyd and Iris Colvin. The Colvins' worldwide adventures continue to be recounted in ham radio circles, epitomizing the spirit of international friendship through Amateur Radio and their 30-year association with the YASME Foundation. 15· "Ham Colonel First to Win World-Wide Award"
24· Off to Clipperton - "No Picnic"
46· The Americans are Coming! 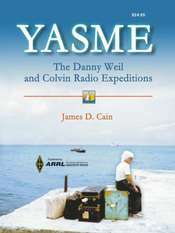 Commissioned by The YASME Foundation and published by ARRL. 320 page. © 2003, The American Radio Relay League.